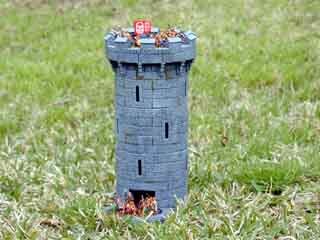 What is a dice tower? It is a structure used to roll dice such that the dice are adequately tossed and randomized. It helps prevent cheating by assuring one cannot influence the dice roll. Often the towers are provided with trays that prevent the dice from scattering across the table. It also serves as a focal point for the gaming table: one no longer has to look at various locations to find the dice. One simply looks to the dice tower. However, dice towers can go beyond utility into the world of art. They can be decorated to echo the theme of a game or a particular era. They can be constructed to make a nice sound when used. They can also provoke thought to the construction of the insides. Dice towers have long provided me with a sense of admiration. In addition to this page, I have made dice towers from basswood and laser etched wood parts. As the cello is to the cellist, so too is the dice tower to the board gamer. 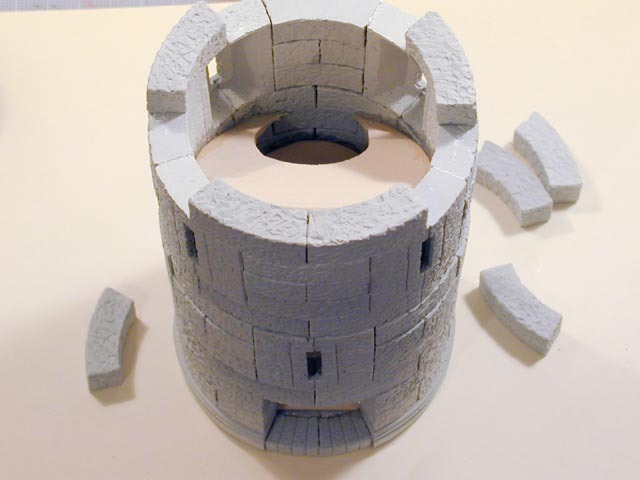 This page shows how to make a dice tower using plaster and a mold from Hirst Arts Fantasy Architecture. 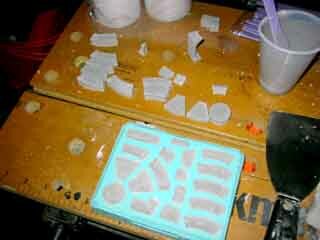 You use the molds to cast stones from plaster. You stack the stones and build a structure that is as simple or as fancy as you like. Then you can paint and decorate your work. As you can see in the photo, the stones are somewhat like architecturally correct building blocks. Often these blocks are used with miniatures gaming terrain or model railroading. Here I modify the tower to be used for rolling dice, and as such the interior of my tower is different than the plans on the Hirst Arts site. This photo shows how to cast the stones. Hirst Arts provides molds in many styles. 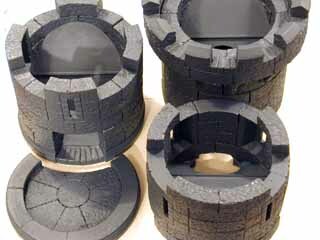 Some molds make square buildings, some make round towers. Some molds look like fantasy architecture, some look Romanesque or Gothic. This mold is the 4" (10 cm) circular tower (mold #52). As you see, one mold makes many different types of blocks that are used to construct the tower. The plaster is a special type similar to the material that dentists use to cast tooth impressions. 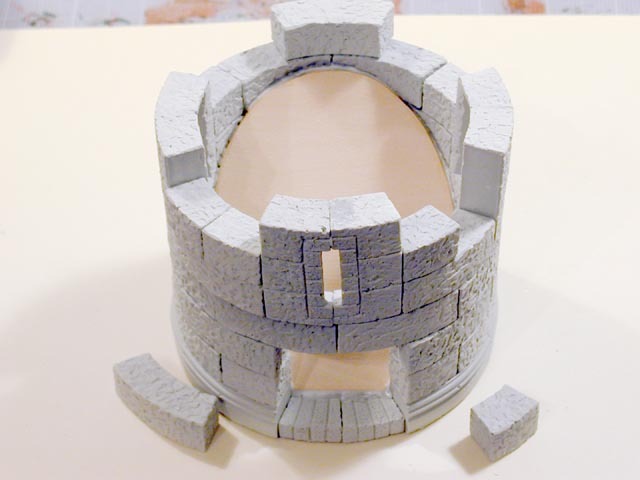 The brand is Excalibur Castle Stone It comes in a variety of colors, sets quickly, is less brittle than Plaster of Paris or hydrocal, and is easy to paint. For $38, Game Plan Games sells a 25 pound box which should last for many projects. Simply mix a small cup of plaster to the consistency of thin pancake batter (about 22 ml of water to 100 g of dry plaster) and pour the slurry into the mold. Pound the table with your fist or use a toothpick to help release air trapped in the cavity. I add about 10 drops of Jet Dry brand dishwashing liquid to a liter of water to help break the surface tension of the water and release any bubbles. After about 5 minutes of setting, I use the wide spatula to scrape off excess plaster and level the bottoms of the blocks. In about 25 more minutes, bend the mold to pop the blocks out of the mold. 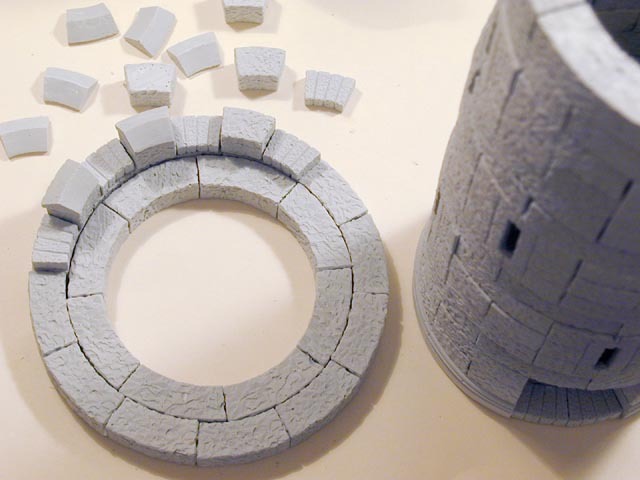 You will need to cast the mold about 18 times to have enough stones to make the dice tower. After nearly 100 castings, my mold shows no sign of tearing or wear. The setting time of the plaster is sensitive to temperature. I do my casting in the garage and once during cold weather of 32F (0 C), it took the blocks nearly 2 hours to set. After that I left my water bottle inside the house, and the room temperature water was enough to cure the blocks in the normal time. 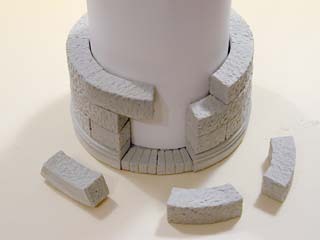 This photo shows the foundation of the dice tower. From the Hirst Arts site I printed the tower plan and made a paper cut out for the floor. The Hirst Arts plan calls for a central spiral staircase, but for the purpose of the dice tower leave out the stairs. We need to use the interior for dice ramps. Here I glue the blocks to each other using Elmer's Craft Bond Tacky Glue. The glue is thicker than normal white or wood glue, and it sets in 15 minutes which helps you build your tower more quickly. This part of the construction is especially fun and hearkens back to the days of playing with blocks in kindergarten. This photo shows the first level nearly complete. There is a gap for the doorway through which the dice will exit the tower. Notice that I have made a paper cylinder to help keep the tower vertical. It also helps keep the proper diameter although the blocks are nicely designed such that they always form a proper circle. When constructing, I rarely sand the bottoms or tops of my blocks. If you are careful with casting and leveling the stones, very little sanding if any is necessary. However, I am not the biggest stickler for a gapless tower. As you see in the photo, there are slight gaps between some of the blocks. 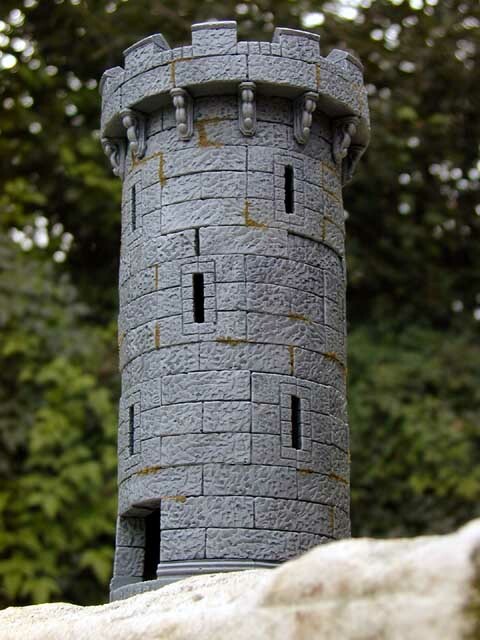 I think the gaps make the completed tower look more realistic and aged. If you want a gapless tower, you should slightly sand each course of blocks so they are more level. Use a drum sander or large sander block to level off the top of the tower with each course and you will have a gapless, new looking final tower. My tower is constructed in three vertical sections that come apart to facilitate painting and fishing out the occasional stuck dice. This photo shows the nearly completed first tower section. I use multiple arrow slit window blocks at 90 degree angle around the tower to key the first tower section to the one above it. The first level dice ramp is also visible in this picture. The ramp is constructed from bass wood which is available at many hobby and craft shops. Glue the ramp with the same tacky glue used on the blocks. Those who remember their school days will recall that Euclid taught us that a cylinder (the dice tower) is intersected by a plane (the dice ramp) with an ellipse. The interior diameter of the tower cylinder is 3" (7.5 cm). This length is used as the short axis of an ellipse that will fit inside the cylinder of the tower. I need the ramp to rest in the tower at an angle of about 45 degrees or more, and using geometry calculated the long axis of the ellipse to be 4" (10 cm). The dice ramp is constructed with the aid of a graphic drawing program such as Jasc Paint Shop Pro or Adobe Photoshop. Here is a 4 by 3 inch ellipse template for Paint Shop Pro. I printed the template onto paper. Then I transferred the paper template to cardboard from a cereal box. Finally the cardboard template is traced onto a piece of 3/32" (1 mm) basswood. 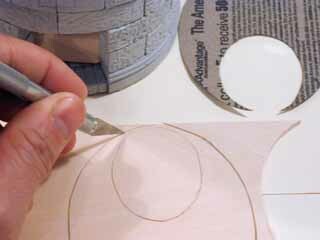 Use an pointy razor knife to cut the ellipse from the basswood. Use multiple passes with your cuts so that you don't split the wood. The upper ramps also need a hole to allow dice to fall to lower levels. The hole is 2" (5 cm) in the long axis and slightly over 1" (3 cm) in the short axis. This photo shows the completed second level of the dice tower. Notice that more arrow slit windows are placed 90 degree apart and offset from the windows of the first level. This level also has a different keying of blocks to mate with the blocks of the third level. The second level ramp is highest over the doorway and lowest at the back of the tower. It is placed so that it avoids bisecting any windows. On taller towers you might want to make the ramps roll left-right and right-left. Since I only have three levels, my ramps all roll front-back or back-front. Once several friends and I were dreaming about conceptual dice towers. Of course, you can use these techniques to construct very high towers. A 6 foot (2 meter) tower using these blocks would be fun. Such a tall tower would take about 10 seconds to make a roll. Another person thought of a motorized car to take the dice to the top. With projects like these, only your imagination is the limit. This photo shows the top parapet of the dice tower. 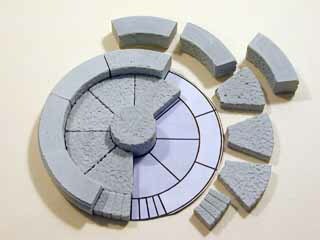 Thoughtfully, the Hirst Arts 4" circular tower mold has blocks for making a wider diameter circle. These are shown on the outer ring of the parapet. Also there are decorative bricks and capstones that are used to make the crenellations for the top of the tower. My dice tower also has a tray to catch the falling dice. This tray is made from the same circular stones as the foundation of the tower. I removed a portion of the circle so that this tray would mate with the dice tower at the dice tower door. To break a plaster block, use a chisel or screw driver to score a line on both side of the block. When the score is about one quarter way through the block, you can snap the block along the score line. Straight lines snap much more easily than circular lines. Make the scoring lines for circles deeper to ensure that the block breaks along the score. Also notice that the center circular block is half the thickness of the normal one. Only fill the mold halfway, and sand the block so it is the same thickness as the stair blocks. This photo shows the 4 sections of the completed dice tower after they have been coated with the base layer of paint. Hirst Arts recommends you use cheap thinned latex or acrylic paint and a 1" brush to apply the base coat. On the other hand, if you are in a hurry, use spray paint as I like to do with the base coat. Since I want a dark tower, this base coat is about 2 parts white to 1 part black. It is similar to the dark Panzer Gray sold by Testors for World War II models. Notice that I put small ribs on each of the ramps. These ribs help catch the dice and roll them more randomly. Be careful that the rib is large enough to catch the dice, but not so large that the dice get stuck. If I were to make one improvement to my tower, I would make the wall of the dice tray higher. Sometimes the dice shoot quickly out of the tower, and the one course of stones is not enough to catch all dice on every roll. A second course of stones would help catch even the very fast dice. 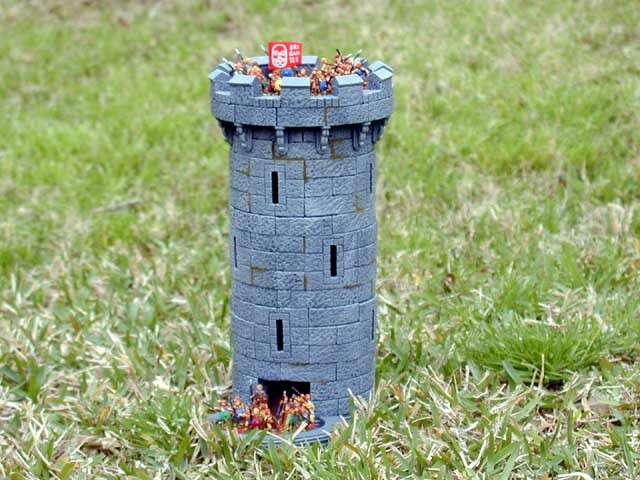 And now, here is the completed tower with some 15 mm Ancient figures on top and near the door. 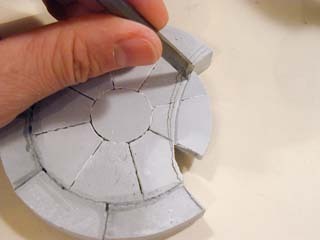 A lighter shade of gray has been dry brushed over the darker base coat. This brings out the texture of the brick. Again, you can do this painting with inexpensive paint from the home center or hardware store. If you look closely, you will see moss growing in some of the stone joints. To help cover up my shoddy construction, I put some glue and some green flocking in the joints. This make the tower look more aged and realistic. The dice rolling performance of the tower is pretty good. It can roll dice from as tiny as 1 mm up to about 16 mm without any dice getting stuck. Using my favorite 12 mm dice, I rolled dice in sets of 1, 2, 3, and 4, and after 100 rolls, no dice ever got stuck in the tower. The larger 16 mm work well in sets of 3 or fewer, but large sets tend to leave a stuck die every 30 or so rolls. Here is one final photo of my tower superimposed on a dramatic backdrop for education purposes. What if the ancient Germans employed large stone towers against the imperial Roman Army in the 3rd century A.D.? And what if the Germans employed large stone dice to kill the advancing Romans? Well, a dice tower such as this certainly helps you answer these gut-wrenching questions. Thanks for reading this far, and feel free to email me if you have any questions or want to share your own dice tower projects. I hope you enjoyed this project as much as I have. Last modified: Thursday, 09-Jun-2011 12:38:44 MST.